Eggs if you are using a hen to sit on your eggs, I am sure the hen will know what to do. You will need to help by having the nursery in a separate pen. If you don’t separate the mother hen, you run a risk of having your chickens or eggs damaged or eaten by other hens. I have tried using a broody hen, but the risk is too high. I prefer using an incubator. Before putting your eggs in the incubator you will need to ensure that you have all the equipment. Incubator, automatic egg turner (preferable), candler (specific light designed to view through your eggs to check for development). Water and temperature guage and power. There are many types of incubators on the market. I prefer a good incubator that has water tray in the bottom (to help maintain humidity) automatic egg turner (this saves manual turning) and a fan to help with circulating air and keeping an even temperature. Day 1 – do not wash your eggs, as they have a protective coating on them, and if you wash this off, you run the risk of disease. Make sure that your incubator has been running for at least 24 hours to moderate the correct temperature. If you are not using an automatic turner, it will be valuable to ensure that you place your eggs with the same mark showing. It does not hurt to do the same thing with an automatic turning incubator, but this is not as important, as you will not need to touch your eggs for 18 days. If your incubator comes equipped with a fan, you can lower the temperature setting by 2 degrees. 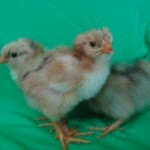 Most poultry incubators are best set between 37 for fan, and up to 40 degrees for non-fan incubators. All eggs should be placed in the egg trays with the point end down. Most incubators come with instructions on the adding of water for the humidity level. You will not need a high humidity until 3 days out from hatching. Have a calendar hanging on the wall handy with all your dates marked on it. This should be checked each day. Day 3 – check water level in the tray. This should be done every 2 days. You may not need to add any water, but check it. If you miss a day you may regret it. So mark these days on your calendar. Day 7 – This is the day for candling. A very good procedure to follow. This will help you eliminate the eggs which have not started developing. Candling involves shining a light through the eggs to see if the embryo has started to form. If the egg is fertile you will see a black blob (this is the eye and the brain), and possibly some veins spread across like arteries. If the egg is not fertile, you will not see any of these features. It will be evenly coloured and not show any of the blobs. The non-fertile eggs should be removed from the incubator at this stage. These eggs can turn rotten very quickly and make a big mess in your incubator if they crack. From this day on all you need to do is check the water level. 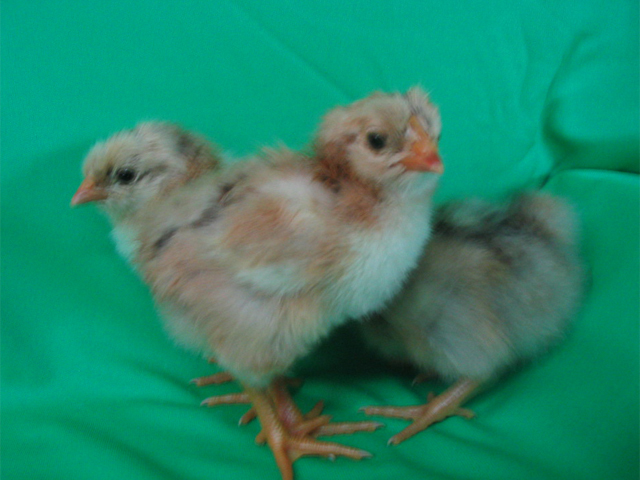 Day 18 – 3 days off from hatching. Now is the time to stop turning your eggs. 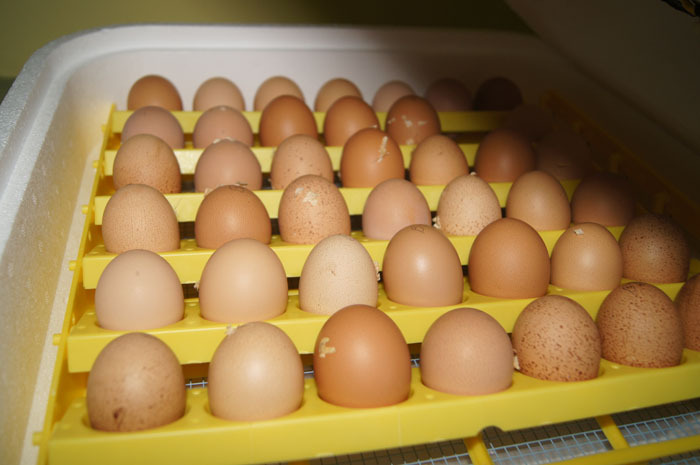 For those who have been doing this manually, you need only to stop, but for those who have automatic egg turning, then you will need to remove the egg turning tray and gently place the eggs back in the incubator. Add extra water to create a higher level of humidity. The chickens will need the higher humidity for hatching. From this stage on reframe from opening your incubator as this will release the humidity. Day 21 – hatching day…. By now you will be able to hear your little chickens chirping from within the eggs, some of the eggs will be starting to crack open. Do not open your incubator. Your chickens will survive for up to 48 hours without feed or water, as they have all they need within the egg when they are hatching. At this critical stage if you open the incubator you are releasing the humidity and you chickens need the humidity to help them hatch. After 48 hours if you still have eggs not hatched, sorry to say but they may never hatch. All eggs should be hatched or hatching by the end of this time limit. Your chickens are so cute and fluffy, but they need you to look after them. The chickens now need to be under a light or a heat lamp. To learn more go to raising chickens.